The Zoo Attraction - A Ferret! 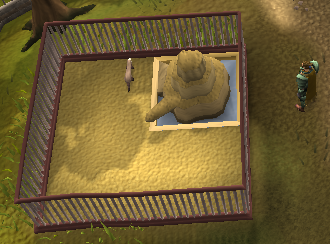 Begin by speaking to Charlie the zoo keeper, in East Ardougne Zoo. You begin the quest by talking to Charlie, the zoo keeper in Ardougne. He will say he is busy, so ask if you can help him. He explains that there was a delivery of a ferret to his zoo. But when the ferret got there, it escaped! And so now the zoo has no new attraction. He mentions a man named Nickolaus, who has agreed to help get another ferret. But they have not heard from him for a while. Your task is to find him. Agree to help. He suggests the mountains, west of the Gnome Stronghold, as a good place to start looking as that's where the ferrets live. There you should find a camp, with lots of ferrets that Charlie told you about nearby. 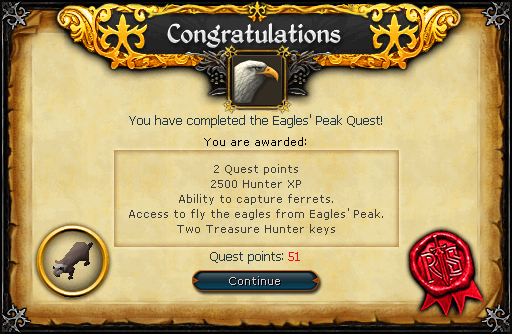 Note that the tracks there have nothing to do with the quest. Now, inspect the books. You will find a bird book. Read it and a Metal Feather will fall out. The book contains information on all the birds used in Hunter skill, as well as information on giant eagles. Next, go up the path in the mountains that those with 25+ Agility followed or climb up back the rocks. You should see a rocky outcrop. When you inspect it, you get this message. Now use that feather you got from the book on the outcrop. It will now become a cave entrance! Enter the cave. 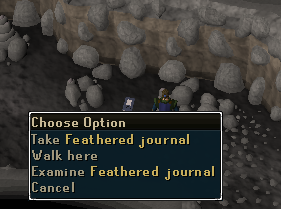 Start walking down the path and you will see a journal on the ground. Read the journal and you will find out about the author and what they have been doing. 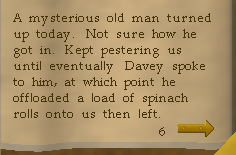 It turns out that they are rather susceptible to random events, even though they were removed years ago (did Jagex forget to update this part of the quest!? I think so!). Now walk to the south path until you get a small cut scene. There you will have found Nickolaus. He will tell you how he has just found the nest of a giant eagle. Tell him that Charlie sent you. He doesn't seem to think that getting a ferret is as important as the giant nest. When you offer to take the ferret for him, he explains all his equipment is at the camp and as he is trapped, he can't go get it. Offer to help. His plan is to trick the eagle into thinking he is one of them, in order to escape. He requires a disguise. He says you need a disguise as well. Now collect 10 of the nearby feathers, then leave the way you came in. The next stop is the Fancy Dress Shop. 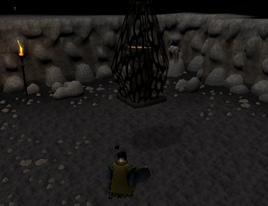 This can be found in Varrock. Speak to the owner, and tell him you want some bird outfits. He says he has none of those in stock. But he offers to make you one. He says you need 10 giant feathers, yellow dye and some swamp tar. 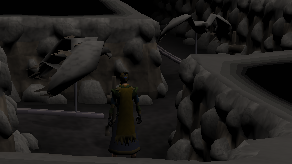 Yellow Dye & Swamp Tar: First, a visit to Lumbridge is suggested. 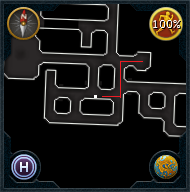 You can use the Lumbridge Home Teleport. 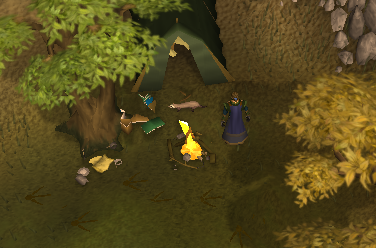 Go to the Lumbridge swamps, found to the north-west of Lumbridge, and collect a swamp tar. 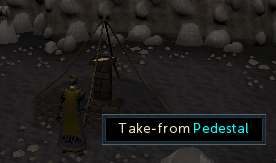 Next, if you do not have some yellow dye, head to Fred's farm (just west of the sheep pen). There is a respawn of onions there. You can also get onions from Rimmington. Collect 2 of these and visit Aggie the witch in Draynor Village. Give her the onions and 5gp and she will give you the dye. Or, you can buy yellow dye for 6gp in Lletya, which is even faster than going to Fred's house as you can use an Elf Teleportation Crystal to get there faster (you must start Mourning's End Part 1 to access the city). Now head back to the Fancy Dress Shop, and give these items to the owner. He says the costumes will cost you 50gp. 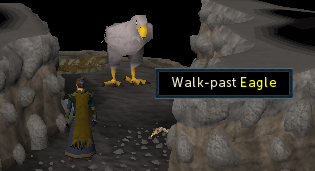 Pay him the money and you will receive 2 eagle capes and 2 fake beaks. 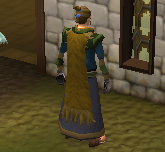 The cape and beak give you no attack or Defence stats. Now you make your way back to the cave. 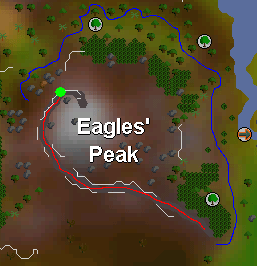 Cast Eagles' Peak lodestone to save walking time. Put your costume on, and go back to where you were talking to Nickolaus before, and shout over to him. At first he will mistake you as an eagle! Reassure him your not going to eat him. Now you need to bring the costume over to him. So you need to find the 3 feathers to open the door. Now head on north, from the entrance of the cave, and enter the tunnel. Inside you should see a birdseed holder. Take some birdseed. It is suggested that you take quite a lot in case you make mistakes. If you make a mistake, then use the reset lever, which is just outside the entrance to this puzzle. Now pull down the lever that is there. You hear something opening. Now walk to the far south-east corner, and pull the lever. Another message appears about hearing something open. Next, you go back and pull the first lever (part 1 lever) again. And while you are there, use some birdseed with the birdseed feeder nearby. Put birdseed on the birdseed feeder there and both birds will move. The first will go back to its starting point, the other will stay next to you. Go to the second bird's starting point, and pull the lever. Now you must go back to the first lever in part 1 that you pulled in this puzzle. 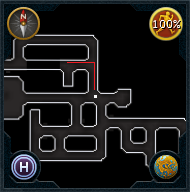 You must walk to where the statue used to be and pull the lever there. Go back to the last part of the puzzle, and make the bird move again, so that it's hiding the lever. Then use the birdseed feeder opposite the bird that has not moved. Now you will have a clear path to the large opening in the center. You can now get the first feather! Try and take the feather. This will happen. Use all the winches and the net should be lowered. Collect the feather and you will now have 2 feathers! Inspect it and you will see footprints. This is where the 27 hunting comes in. You need to track the footprints to their owner. Use the tracking method you use in normal hunting, until you find an opening. 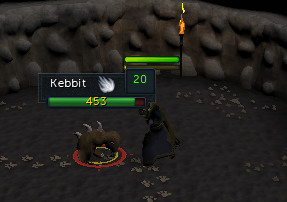 When you do, a level 20 Kebbit will come out and attack you. Kill it and receive the final feather. Make sure you are wearing both parts of your costume, and choose to walk past it. You will safely get to the nest. Speak to Nickolaus. Give him the disguise, and he will tell you to meet him at the camp. So leave the cave, and go back to his tent. He will now be there, so talk to him. You can talk to him about the eagles, and he will tell you that with rope, you can use them to fly places! Mention the ferret (your purpose of actually being there). He will then teach you how to catch ferrets. You can use this method after the quest is completed. Now that you have your ferret, you can return to Charlie at the zoo. Tell him that you have a ferret for him, and the quest will be complete. 1. Set up a box trap. 2. Bait the trap with meat. You can now fly the four eagles! The four eagles are found near the giant eagle you sneaked past earlier, at the nest. Go past the mess in the room, and round the corner to see them. There are four different types of eagles: Polar, Jungle, Karamjan Jungle, and Desert. Takes you to the polar hunting area. You will arrive in a big snow cave, where there are two polar eagles. Head west, where there are two caves exits. 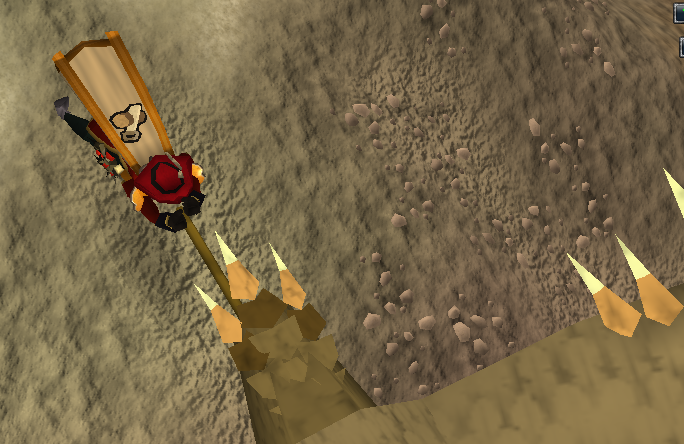 Leave through the smaller cave, and climb down the handholds to get to the polar hunting area. You can use this method to go back. Takes you to the jungle hunting area. Like the polar eagles, they will take you to a cave with two nests. 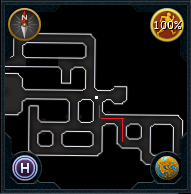 Exit through the smaller cave to arrive near the hunter tutor. You can also use a Teasing Stick with the young vine northwest of the hunting master, it will grow into a ladder so that you can access the Jungle Eagle. This Eagle is available after the Back to my Roots quest. Flying on the Karamjan Eagle will land you on a platform above the Jade Vine Maze. Climb down the vines to get to the main surface. Takes you to the desert hunting area. Like both the polar and jungle eagles, they take you to their cave with two eagles inside. However, you can't leave that cave due to a boulder blocking the exit. You will need to find the entrance first, and push the boulder out of the way to use this method. The entrance is north of the desert phoenix (used in The Golem quest), and west of the clay mine in the desert north of Ruins of Uzer. 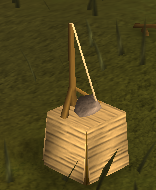 Once the boulder is pushed out of the way, you can use this method both ways. 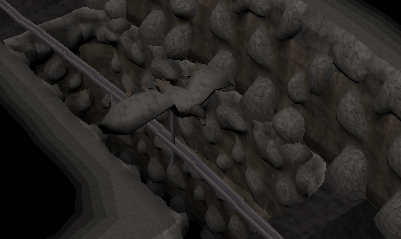 There are rope respawns on the three landing sites for the hunting areas, but none on the three eagles in the cave. You also do not lose your rope when you use it on any of the eagles.